One year ago today, Baby Ben joined our family. 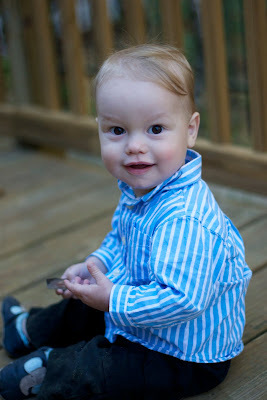 Hard to believe that he's already reached the one year old milestone. Benjamin is the happiest baby we have ever had. Nothing against the other two because they had their own standout qualities, but the Happiest Baby title goes to Ben. He is a good sleeper, a good eater, and all around quite content to sit and play. He loves to laugh at his brothers and they love to make him laugh. He loves to snuggle with his blankie. He also loves to play hide and seek and crawl all over the house. He's a super sweet one! Happy Birthday, Baby Boy #3! And Happy Birthday to your happy baby boy Ben. You are a blessed woman, Nicole. Enjoy all the celebrations!